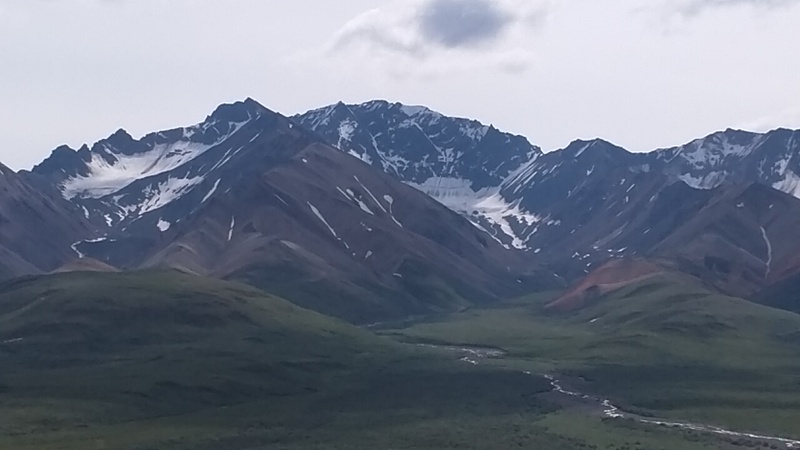 Published on July 8, 2017,	by admin in Alaska Trip. 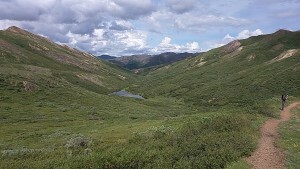 Yesterday I rode to Denali and purchased a ticket to ride into the wilderness area of Denali. The bus trip I purchased, 53 miles to the Toklat River, was the shortest excursion they offered into the heart of the park. Some of the tours were over 90 miles and lasted all day. I figured that 6 hours on a school bus would be long enough. During the night it rained and rained. My bus ride was scheduled for noon so I was hopeful the rain would stop before I had to leave for the park. If it was still raining in the morning, I would have to pack everything and drive Minnie instead of Honda. Luckily, the morning was dry but still very cloudy. 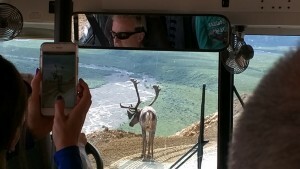 I could ride Honda but a peek at Denali’s peak was not going to happen. The seats on the bus were a lot better than I feared. They were actually quite comfortable with adequate leg room. The bus driver was very knowledgeable and personable, too. Several people said we were lucky to get him. The bus driver is not actually required to narrate the tour back into the park but we received lots of information from a nice guy. 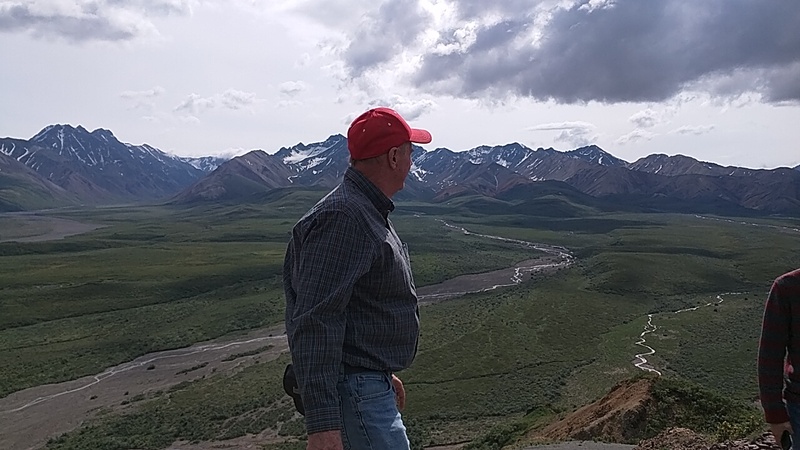 Our driver ( whose name is Dale, but that doesn’t have anything to do with this) has worked as a driver for the park for 35 years, knows a lot about the park, is an avid Denali backpacker, and has a great personality. Every time he would ask us if he should stop talking and let us enjoy the park in silence, we would all exclaim that he should keep telling us stories. If you see the tallest mountain you are lucky. Most that come to the park only see clouds, and we would be amoung the many. We saw a few Caribou, a bald eagle, a moose, a snowshoe hare, and a tarm… patr… part… tparm… chicken. But the one animal that evaded us all was the mighty Grizzly. 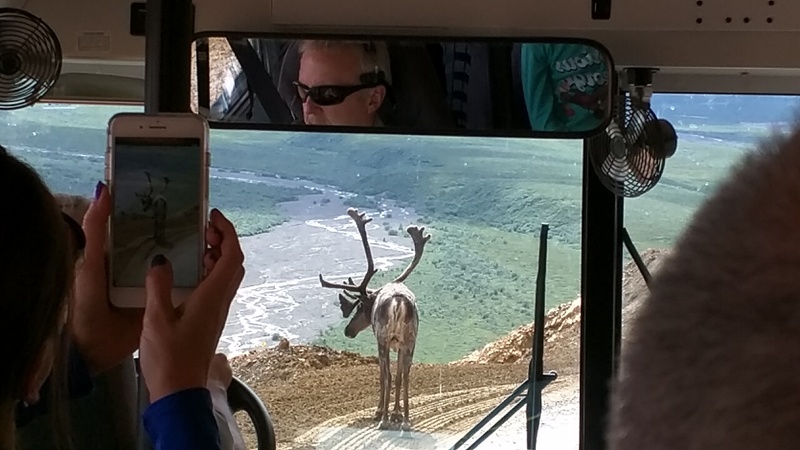 Caribou in the road. He wouldn’t move! It was a fun day with a good group of people. I took lots of pictures but it is one of those places that can’t be captured with a camera. The mountains are too grand and the animals too far away to photograph without a telephoto lens. I’m going to go back over tomorrow and try to catch the sled dog demonstration. Sorry you didn’t catch a glimpse of the peak, but you may have other opportunities in the coming weeks. You don’t have to be in the park to see it, so on every clear day, look that direction and see if your view is in range. 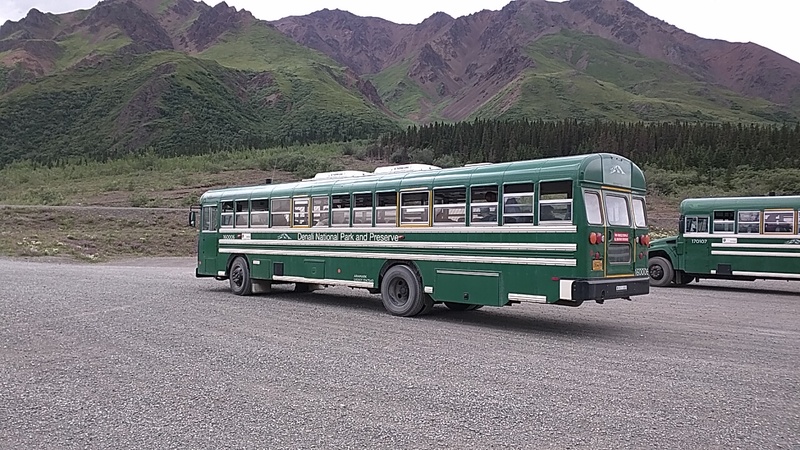 On our bus tour in (in 2015), an Athabaskan woman boarded during one of the stops and told us some interesting history about her tribe and the area. Did you get that experience? We did not get a talk from an Athabaskan Native, but a volunteer that has a deaf son boarded our bus at the check point and taught us sign language for the animals we would see.